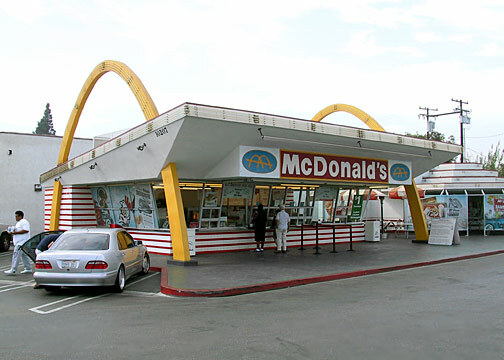 Designed by the architect Sanely C. Meston and his assistant Charles Fish, Downey is the oldest operating McDonald's in the world. 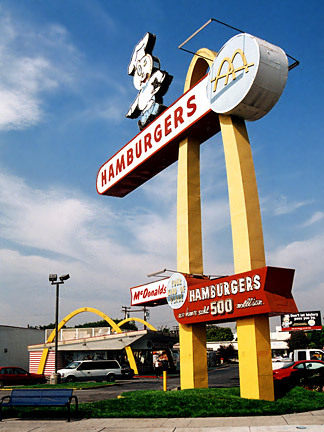 Since it was franchised not by the McDonald's Corporation, but by the McDonald brothers themselves to Roger Williams and Burdette Landon, the Speedee McDonald's was not required to comply with the McDonald's Corporation's remodeling and updating requests over the years. 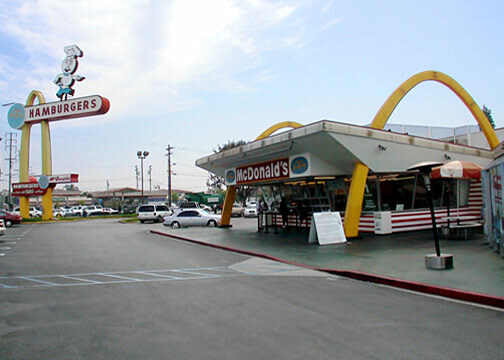 Recognizing the historic and nostalgic value of the intact 1953 structure, the McDonald's Corporation acquired the store in 1990 and rehabilitated it to modern but nearly original condition, and then built an adjacent museum and gift shop to commemorate the site. Inside the small museum are many McDonald's artifacts from over the years, and also a small display showing how the restaurant buildings evolved from the small walk-up candy striped stands to the large modern mansards. This is the oldest operating McDonald's hamburger stand in the world. When opened, hamburgers were 15 cents, and french fries were 12 cents. The towering chef, "Speedee" was McDonald's first mascot and symbolic of fast, efficient service. Opened on August 18, 1953 by Roger Williams and Burdette "Bud" Landon, Downey's was the third franchised by Richard and Maurice McDonald who founded the chain in 1948. Ray Kroc, then a Multimixer milkshake salesman and later founder of mcDonald's Corporation, visited this building in 1954 to prepare for construction of his first McDonald's franchise in Des Plaines, Illinois which opened in 1955. 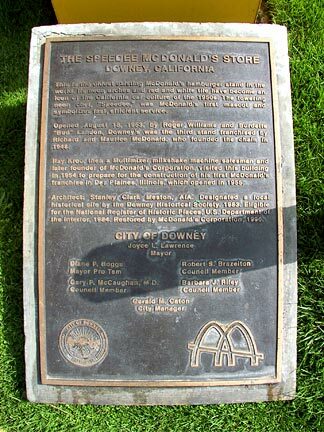 Ray Kroc bought out the McDonald brothers for $2.7 million. However, this location was the only "McDonald's" which was never affiliated with McDonald's Corporation: this restaurant did not become a part of the McDonald's system until 1990. Speedee was replaced by a new logo in 1961. Ronald McDonald was created in 1963 with Willard Scott as the very first Ronald McDonald. In 1994, the "Speedee" store was closed due to damages caused by the Northridge earthquake. The store reopened on December 15, 1996 with the addition of the museum and gift shop. Lakewood resident and McDonald's owner operator Ron Piazza assumed ownership of the Speedee store from McDonald's Corporation on July 1, 1998. Above: The store became a franchised unit again in 1998. The operator, capitalizing on the site's historic and nostalgic value placed a brief history of the location near the walk-up windows. 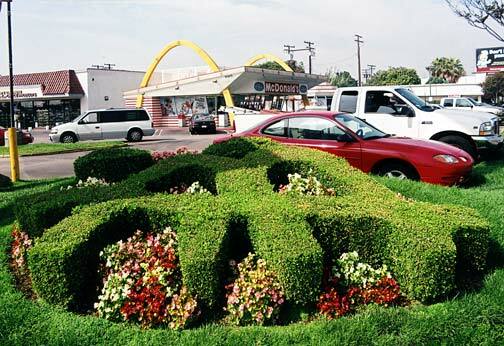 Below: The McDonald's Corporation's original logo which was a simplification of the candy striped Golden Arched building was recreated as topiary at the Speedee sign's base. 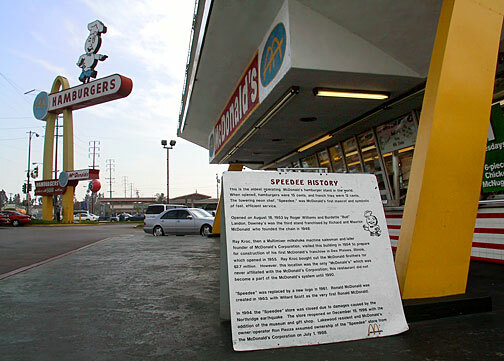 Above: A plaque was placed at the base of the Speedee sign by the City of Downey in recognition of the site's historically significance. This is the oldest existing McDonald's hamburger stand in the world. Its neon arches and red and white tile have become an icon of California car culture of the 1950s. The towering neon chef, "Speedee," was McDonald's first mascot and symbolized fast, efficient service. 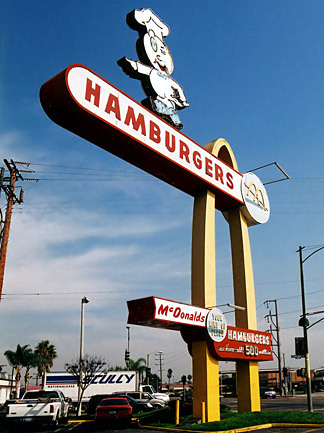 Opened August 18, 1953, by Roger Williams and Burdette "Bud" Landon, Downey's was the third stand franchised by Richard and Maurice McDonald, who founded the chain in 1948. Ray Kroc, then a Multimixer milkshake machine salesman and later founder of McDonald's Corporation, visited this building in 1954 to prepare for the construction of his first McDonald's franchise in Des Plains, Illinois which opened in 1955. Architect: Stanley Clark Meston, AIA. Designated a local historical site by the Downey Historical Society, 1983. Eligible for the National Register of Historic Places, U. S. Department of the Interior, 1984. 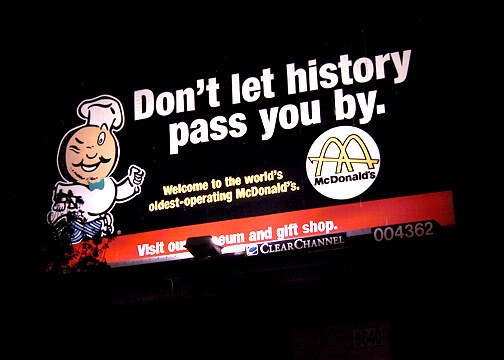 Restored by McDonald's Corporation, 1996. Everything was carefully designed for maximum attention grabbing. 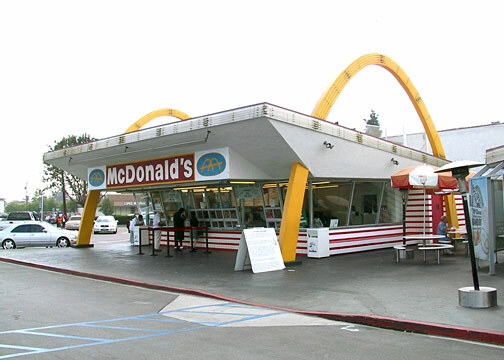 Architects Meston and Fish wanted the McDonald brothers' stands to be different from everything else--they succeeded, and a cultural icon was created.